Maine’s senators say they hope the compromise will bring an end to crippling partisan stalemates. WASHINGTON — The Senate passed the first federal budget bill in more than four years on Wednesday, easing automatic spending cuts and likely averting another potential government shutdown in January. The chamber passed the two-year budget bill on a 64-36 vote late Wednesday afternoon, nearly one week after the House of Representatives endorsed the measure by a more lopsided 332-94 vote. President Obama is expected to quickly sign the spending blueprint into law, ending a politically raucus year on a more bipartisan note. The bill sets annual spending at roughly $1 trillion in the current fiscal year and in 2015, up from the $967 billion previously authorized under strict budget caps aimed at reducing the federal deficit. The compromise also reduces the “sequestration” budget cuts by $63 billion, or roughly one-third of the cuts slated for the next two years. But the bill avoids adding to the deficit by increasing fees on airline passengers and corporate pension programs. The bill also reduces inflation adjustments for younger military retirees, a controversial provision senators have promised to correct next year. Maine Sens. Susan Collins and Angus King voted for the bill, which should allow the government to avoid a mid-January government shutdown. The bill, however, fails to deal with major tax, spending and entitlement challenges facing Congress. The Maine senators said they hope the vote – coming roughly two months after a politically embarrassing and economically painful government shutdown – signals a thaw in the partisan freeze gripping Washington. King and Collins both said they believe easing the across-the-board sequestration cuts will provide more certainty to Maine defense contractors and to other programs reliant on federal funding. 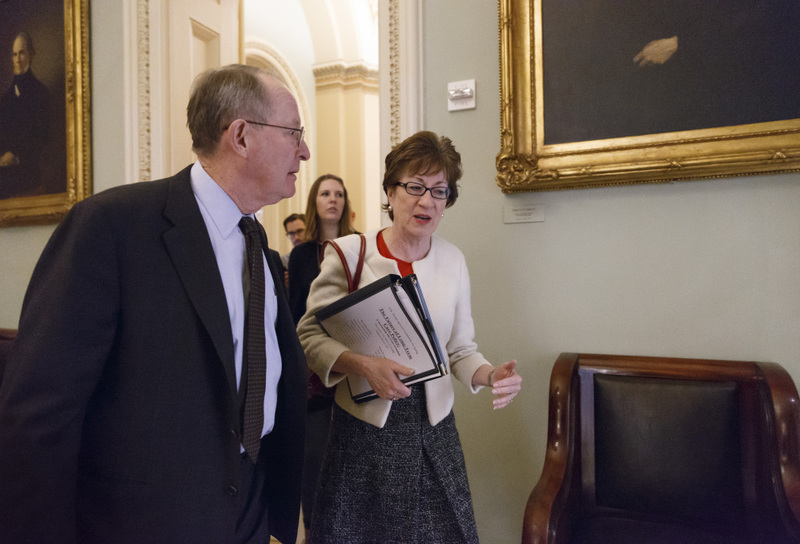 Collins said that the compromise, while imperfect, would “create certainty that has been sorely lacking for far too long,” while reducing Pentagon cuts affecting military readiness and thousands of jobs in Maine. As a member of the Appropriations Committee, Collins will be involved in planning how to spend the money within the $1 trillion budget cap. It is too early to say exactly how the budget will impact federal programs in Maine because the bill is essentially a budget blueprint that establishes spending levels for the next two years. House and Senate appropriators are expected to begin meeting soon to make specific spending decisions. Maine’s defense industry and social service programs could benefit from the easing of the sequestration cuts – inflexible annual spending reductions triggered by Congress’ failure to agree on its own deficit reduction plan. The bill could relieve some financial pressure on social programs in Maine such as Meals on Wheels and Head Start that struggled to absorb sizable budget cuts this year. Some employees at Portsmouth Naval Shipyard were furloughed earlier this year as a result of the budget cuts and then again during the 16-day partial shutdown of the federal government in October. The Navy cited the budget cuts and cost overruns when it decided to scrap rather than repair the fire-damaged USS Miami submarine. Bath Iron Works, a General Dynamics-owned facility that builds Navy ships, is still waiting to hear whether Congress will cover a sequestration-related shortfall needed for the Navy to finalize a contract for an additional $700 million destroyer. Much to the dismay of Democrats, however, the budget measure does not extend long-term unemployment insurance. That means roughly 3,300 Mainers will lose unemployment benefits after Dec. 28. While Senate Majority Leader Harry Reid, D-Nev., has vowed to bring up the unemployment insurance issue as soon as the Senate returns in January, it is unclear whether Democrats can secure an extension in the Republican-controlled House with the political leverage provided by the larger budget bill. Some Senate Republicans and conservatives continued to criticize key components of the bill on Wednesday. “What we have before us is a bill that’s a political compromise for the parties in Washington to keep us from doing what we really need to do: the hard things,” said Sen. Tom Coburn, an Oklahoma Republican and spending reform crusader who heaped blame on both parties. The most controversial provision concerned the way the budget produces more revenue – to help offset the sequestration adjustments – by reducing the cost-of-living increase for military retirees under age 62. The Associated Press reported that, according to one estimate, a sergeant first class who retires at age 42 after 20 years of service would see a nearly $72,000 reduction in benefits over his or her lifetime as a result of the changes. The push to change that provision gained momentum on Wednesday when it was revealed that disabled veterans who were wounded or received a service-related injury, as well as their survivors, would also see their cost-of-living adjustments drop. Many lawmakers, including Maine’s Collins and King, said they support changing the bill to avoid reducing the cost-of-living adjustments for military retirees.